Cloud storage is widely used to ease the storage burden of clients. Meanwhile it raises a basic issue in the security of outsourced data: whether the corruption can be detected and recovered? Focusing on this problem, most existing proofs of retrievability (POR) schemes relies on precomputed tokens or tags as well as code redundancy to achieve integrity verification and corruption recovery, which, however, results in extra storage cost for cloud storage and high computational overhead for clients. 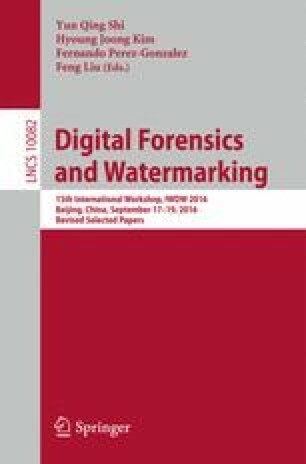 Fragile watermarking provides a new way to implement the scheme without such drawbacks. In this paper, we propose a novel fragile watermarking based public auditable POR scheme for archival cloud data, which is able to not only improve the efficiency of audit process but also ensure both privacy-preserving and replay attack resistance simultaneously. The simulation results validate both the correctness of our scheme in detecting and recovering data corruption and the large improvement in performance compared to traditional POR schemes. This work is supported by the National Natural Science Foundation of China under Grant No. U1405254, No. U1536201 and No. 61472092; The National High Technology Research and Development Program of China (863 Program) under Grant No. 2015AA020101.